Alright Nomsters, we’ve been getting messages left and right about this topic so we’re extra excited to share today’s post with you guys. We’ve asked 4 of our favorite Maryland foodies to talk about the best crab cakes in Baltimore, and you’re definitely going to want to see who made the cut. So, without further ado, let’s kick things off with Fleet Street Write Up. Whenever I go for a crabcake, not only do I go for size, but I go for less filling and more crab meat. The only place I know in the Baltimore area that doesn’t sleep on the crab meat is Timbuktu. A lot of places put way too much filling or too much mustard, which I don’t really like in my crab cake. I like going for lots of chunky, quality crab meat, and Timbuktu does this well. They pack so much crab meat together, which causes the whole crab cake to be HUGE. I literally can only get through half a crab cake. I also like how you have the option of getting the crabcake fried or broiled, but we all know broiled is the way to go! 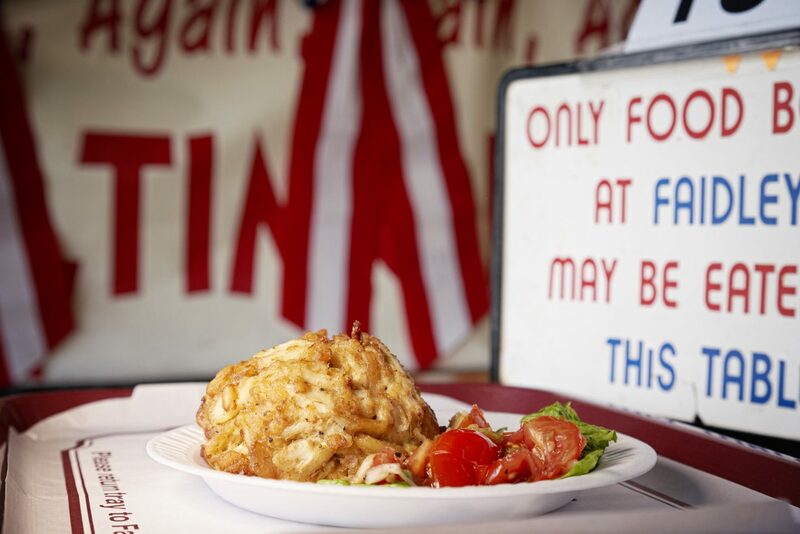 Asking for the best crab cakes in Baltimore is kind of like asking New Yorkers who serves the best pizza or Philadelphians where’s the best cheesesteak—you’re bound to get passionate opinions and recommendations. My favorite crabcakes are from Faidley’s Seafood, a restaurant/market found inside the historic Lexington Market. They’re so good, in fact, that I still remember the very first time I had the jumbo lump crab cake there. I was a freshman at Johns Hopkins University and an upperclassman friend of mine took me to get “the best crab cakes ever.” We drove to Lexington Market a little before noon to beat the lunch crowds and ordered the jumbo lump crab cakes. We picked up our food on the maroon plastic trays, carried them over to the high-top tables, and prepared to eat the crab cakes. I took one bite of the softball-sized jumbo lump crab cake and was an instant believer. Though I grew up in Maryland, this was the first time I had a crab cake that, instead of having a ton of filler ingredients, had substantial chunks of delicate and sweet crab meat. It was love at first bite. And my Faidley’s love story is still going strong. It’s still the place I go to when I want crabcakes as well as the place I take my out-of-town friends when they ask for a taste of Baltimore. So if you haven’t been to this Baltimore institution, you really ought to make your way to Faidley’s. Don’t be intimidated by the neighborhood (it’s safe) and make sure to get the jumbo lump crab cake (not the backfin)—it’s worth the extra cost. And if you have extra time, check out the rest of Lexington Market—it’s a fun place to wander about: you’ll be able to see and buy everything from the freshest seafood at Harbor Fish to Baltimore’s famed Berger Cookies at Berger’s Bakery to even raccoon and muskrat (when in season) at Faidley’s! I often get asked who makes the best crab cake in town. While I’ve had hundreds of crab cakes, it is often hard to compare a crab cake I had yesterday with one I had a year or two ago. However, one particular crab cake often comes to mind. Last month, I decided to refresh my palette and revisit some of Baltimore’s top crab cake spots. I reconfirmed that my top pick still holds the crown. Jumbo lump. Check. Minimal binder. Check. Perfectly spiced. Check. Freakin’ huge. And checkmate. And the winner is… Pappas! 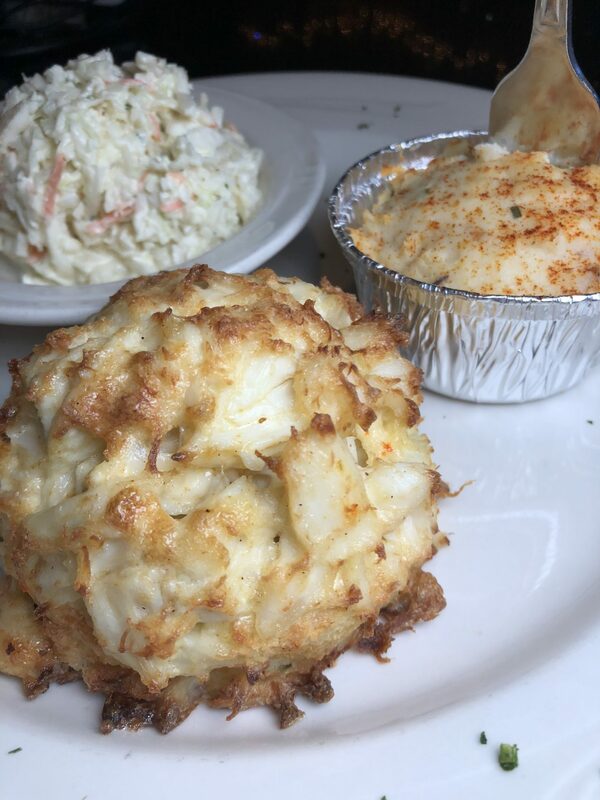 Pappas has been serving up crab cakes for decades and is often touted as Oprah’s favorite crab cake. Their crab cakes are available at multiple locations, at the bar, in the dining room, for take out, and even shipped. 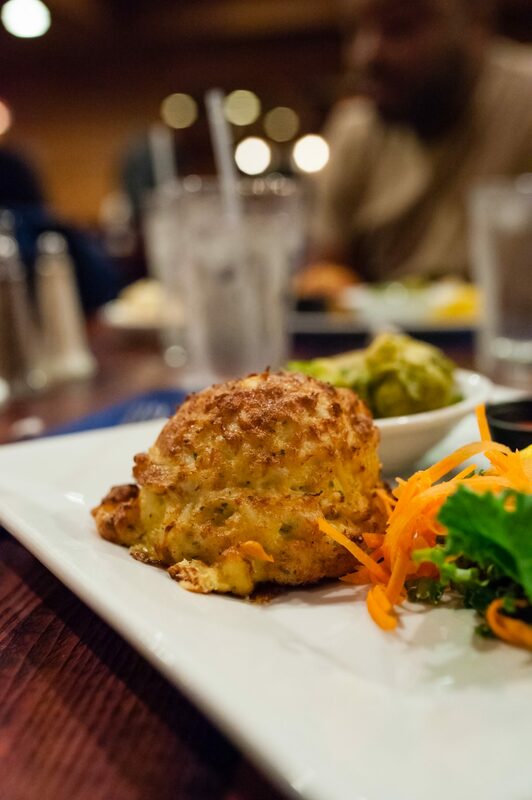 If you are on a quest for the best crab cake, definitely put Pappas on your list. Follow Charm City Food Adventures on instagram! Baltimore restaurants is chock full of good crab cakes. It’s almost too much of a barrier to entry for a new restaurant to serve up a crab cake because Baltimore is intensely loyal to their favorite spot for crab cakes. The flip side to the goodness of crab cakes is that with the decline of the Maryland Blue Crab population, decline of immigrant visas for crab picking and the variety of other offerings in the city, the price of the crab cakes has soured to the $25 to $30 level in several restaurants. In writing this piece, I was looking for a great crab cake at an accessible price point that was still relatively inside Baltimore City limits. Gertrude’s. On Tuesday nights, you can get a crab cake (with coleslaw and fried) at Gertrude’s for just $15. Chef Douglas Wentzel has taken over for Baltimore legend, Chef John Shields but their iconic crab cake remains the same and it remains a popular choice for their Tuesdays with Gertie special menu. The crab cake is broiled with a mix of lump and back fin. It’s about a quarter pound and hits all the creamy sweet notes you want in a crab cake. If you can’t make Tuesdays, Gertrude’s now has a patio party on Wednesdays where you can find the crab cake creatively presented in a banh mi style sandwich. Gertrude’s is located in the Baltimore Museum of Art so make sure you take in some exhibits before or after your indulgence with their crab cake. The Avenue Kitchen and Bar. Chef Audiel Vera has put has stamp on this relatively new Hampden destination. The space formerly housed Le Garage and The Avenue has continued its’ reputation of good food, good drink and a good time. 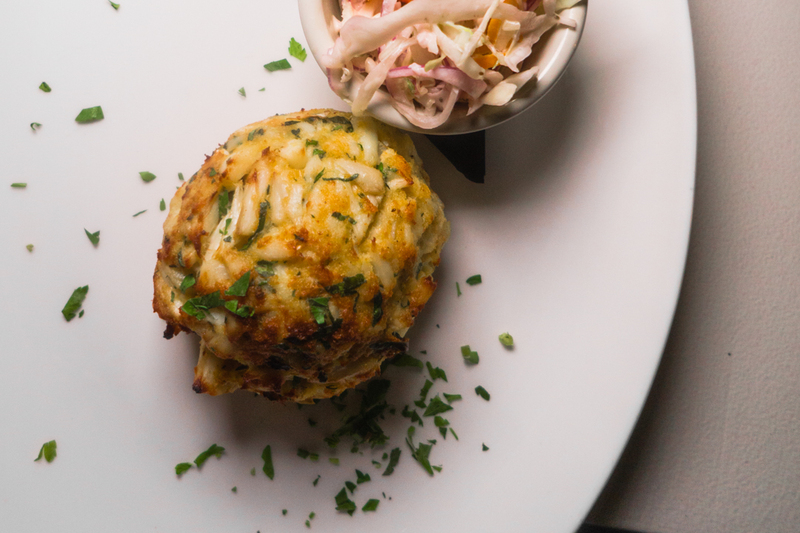 On Wednesdays, you can get their 1/2 pound crab cake for just $15. This broiled beauty is all jumbo lump crab and while you need to order sides separately, you don’t really need the sides. 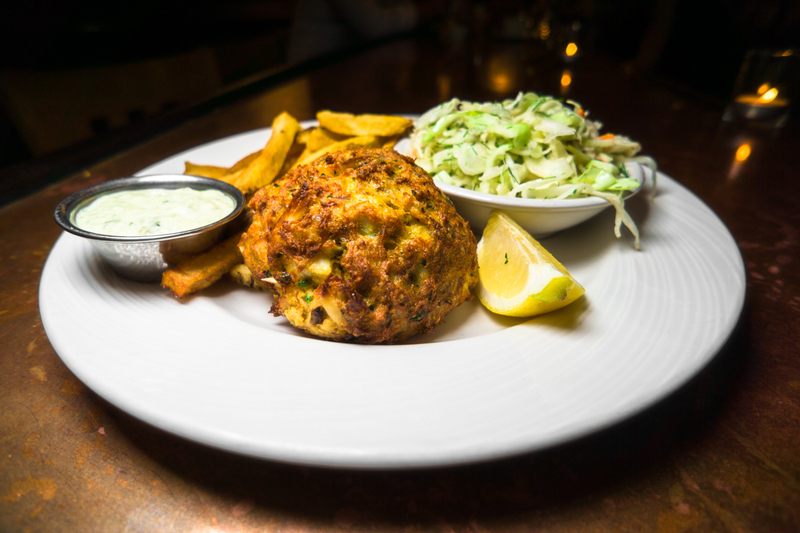 All you really need is a glass of wine ($20 bottles on Wednesdays too) or a beer (Naragansett Beers are $2.50 all night) and this massive beauty of a crab cake. This too has all the creamy sweet flavors that you look for when you crave a Maryland crab cake. The Avenue runs specials four other nights of the week (including a lobster night) but the crab cake is definitely the highlight. Alright Nomsters, which crab cake looks the yummiest to you guys? Definitely let us know what you think by commenting below. A huge thanks to our foodie friends for spilling the beans on the best of Baltimore! Make sure you check them all out and follow for more noms on the regular. To browse more MD foodporn, click here. Until next time, friends!